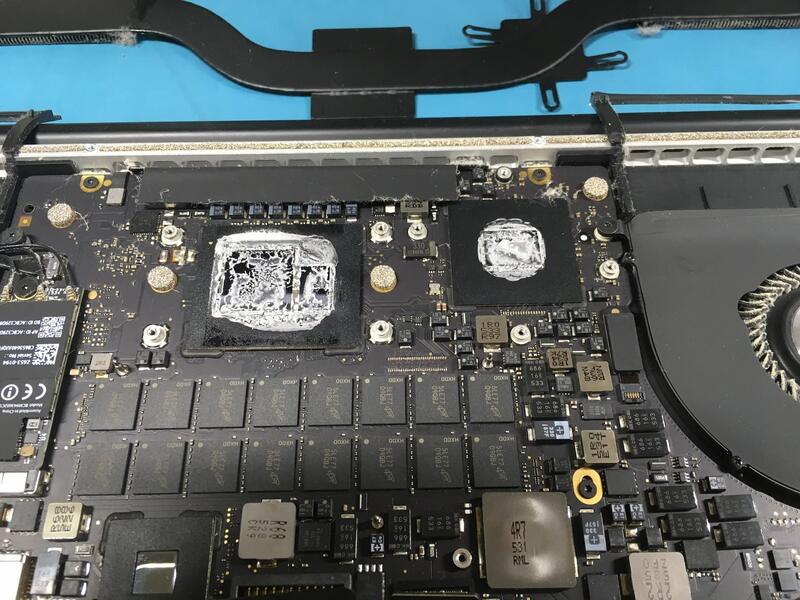 It’s been known since the introduction of Intel Macs that the folks who put together Apple’s laptops apply too much thermal grease. Thermal grease is the gooey stuff that’s applied to the CPU and GPU (if one is present) to ensure the best possible bond with the heatsink. A heatsink is a metal device that uses copper to rapidly radiate heat away from chip(s). It’s connected to one or two fans that blow across it. Therefore, proper bonding of the heatsink to the chip(s) via thermal grease provides the best possible cooling of the chip(s). Many accuse Apple’s heavy handed approach of actually working to insulate rather than efficiently cool the chip(s). This means the fans have to work harder to keep the chip(s) cool, and therefore the battery life gets used up more quickly. Even worse, some say the excess heat can lead to premature death of the chip(s), and therefore the MacBook Pro itself. In other words, this is the grease applied at Apple’s manufacturing plant. Yuk! The chip at the left is the CPU, while the chip at the right is the GPU (note: not all MacBook Pros feature a GPU). Above the MacBook Pro case you can see the heatsink itself, which in the case of most MacBook Pros is a wide metal bar. Ideally the grease would be just on the chip die surfaces, rather than spread across the entire top of the chip surface. I’ve rebonded/regreased the heatsink of every MacBook Pro I’ve owned (and a white Intel MacBook before that). All had extremely long lives. If you can’t wait to see the results of my latest effort, scroll to the bottom of this web page. 3. You do all of this at your own risk. You take responsibility for it. You make the choice to do it. I tried hard not to make any mistakes below but I cannot be held liable for any omissions or bloopers. Thermal grease, a.k.a. heatsink compound. That’s the syringe in the photo above. You only need a tiny, tiny amount – literally maybe a gram or two – and will be forced to buy way more than you’re ever going need. People online argue about which brand is best. Just google if you really want to. Isopropyl alcohol, to clean off the old thermal grease. Again you won’t need a huge amount. I got a 250ml bottle and used almost none of it. Paper towels and Q-tips for cleaning off the old grease (also known as kitchen roll and cotton buds for UK readers). 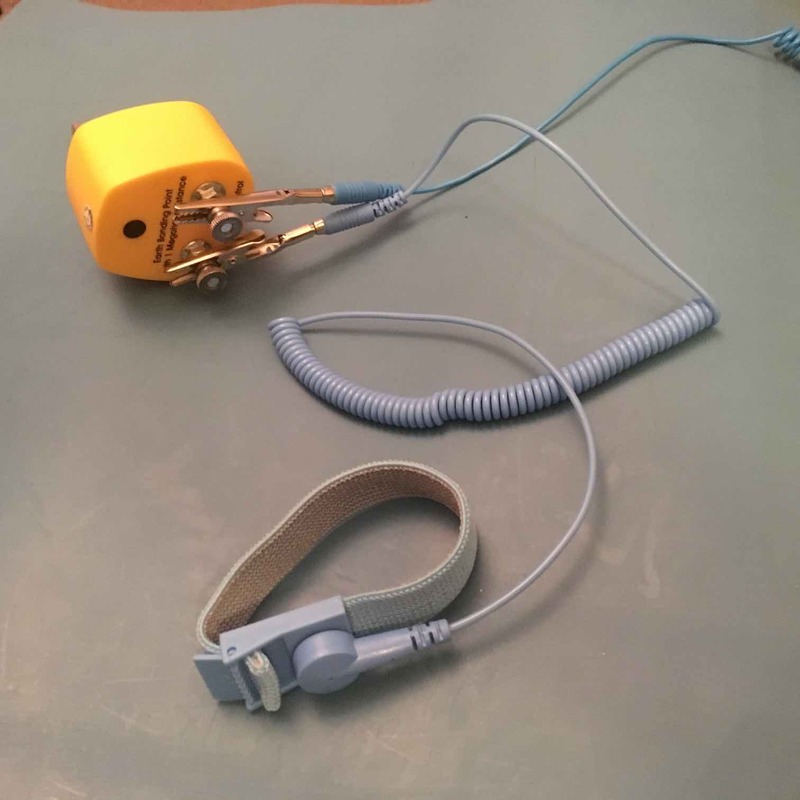 Anti-static protection ideally including an antistatic mat, earthing plug and wristband. I really cannot emphasize this enough. Some professionals laugh at precautions like this but the risk of zapping a component with static is serious. It’s a mistake to assume that a zap will outright destroy a component, or that the zap will be seen. The electrical discharge might be invisible and might just damage something so that it becomes faulty 1 in 1000 times it’s used. Why take the risk? Screwdrivers, including the right size and shape for your MacBook Pro, including its bottom case and the screws used to fix the heatsink in place. I used a bag of screwdrivers bought to repair iPhones. They cost almost nothing on eBay. Metal polish to polish the heatsinks, of which more later. I used an old bottle of silver polish I had hanging around. You need one of those marginally abrasive old-fashioned polishes, rather than one of the newer magical liquid cleaners. 1. Remove the bottom case of your MacBook Pro. 2. Possibly remove the logic board. 5. Polish the heatsink copper pads. 7. Put everything back together again. (b) The steps are detailed far better than I could ever write them over at iFixIt. Often there will be a specific guide to removing the heatsink for your model, or you might just have the follow the general teardown steps and stop when you’ve removed your heatsink. Just search for your model at iFixIt, which will be identified by its year of manufacture and size of screen – both of which you can discover by clicking the Apple menu, then About This Mac. Before even lifting a screwdriver read and reread the steps for your model so you’re absolutely sure what you’re doing, and what to expect. Print them off if it helps. 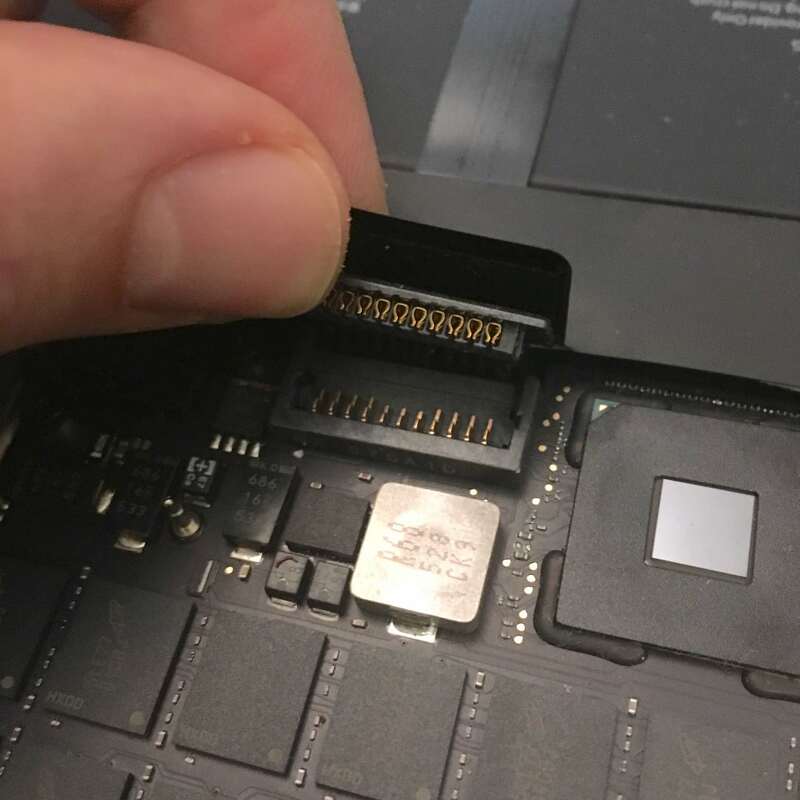 Don’t forget the most important early step, which is to disconnect the battery from the logic board as soon as you open the case. Once you’ve got the heatsink off, use the dry paper towel to remove as much of the old thermal grease as possible from both the chip(s) and the heatsink surface. Don’t scape! Using even a plastic tool to scrape can cause scratches in the soft copper used for the heatsink surface. That means the heatsink won’t be as efficient because less surface area will be able to touch the chip. 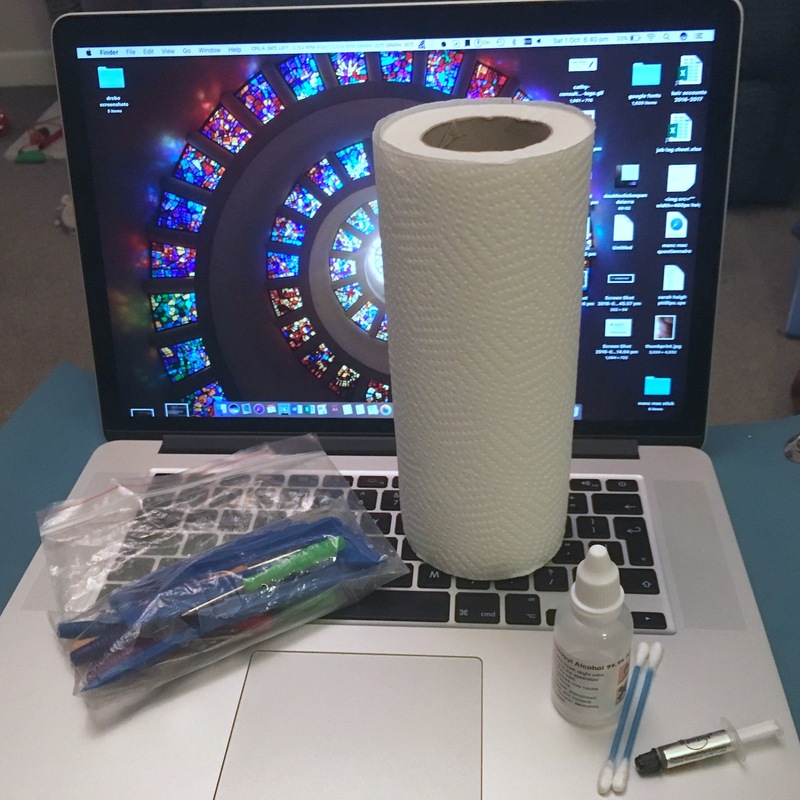 Next, use the alcohol to remove the remaining heatsink compound by applying it to a piece of paper towel or a Q-tip. Use the alcohol sparingly, and definitely DO NOT saturate either, but try to get the chip(s) and the chip die(s) as clean as possible. Use small amounts of metal polish to shine the heatsink copper pads that make contact with the chip(s). Polish repeatedly but carefully until you can start to see your reflection in them. Take a look at the photo below. It’s not the best shot but the left-hand heatsink shows the reflection of my fingers taking the photograph, while the right-hand heatsink is still dull and fuzzy because it hasn’t yet been polished. While polishing be careful not to apply too much force so that you bend or distort the heatsink component. I didn’t believe polishing the heatsink was worthwhile until I tried it and saw a massive improvement in cooling. In fact, I rebonded the heatsink on two separate occasions, polishing only on the second attempt. Temperatures dropped substantially between each attempt. Once you’ve got the heatsink copper pads polished nicely, use the alcohol to thoroughly clean them. Ensure there’s no fluff or dust on either the chip(s) or heatsink coppers. At this point it’s not a bad idea to clean dust and fluff out of the fans, and the air intake areas. Canned compressed air is good for this. Apply a tiny, tiny pea-size amount of heatsink compound in the centre of each of the CPU, and then the GPU if you have one. Don’t spread it yourself! 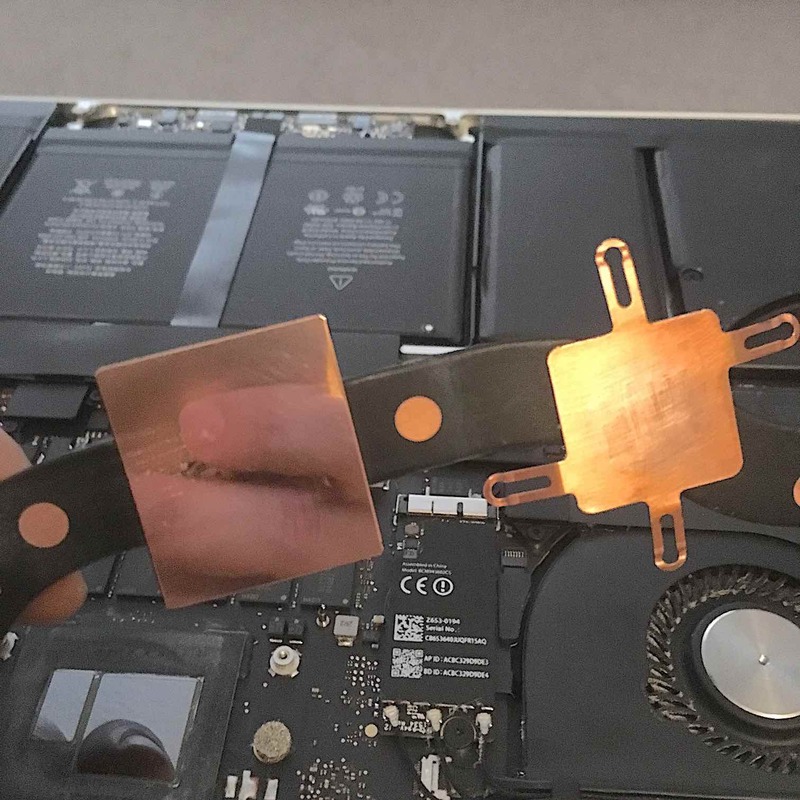 It will be squashed out and spread evenly when the heatsink is reapplied, which you should do next, and then follow your initial steps in reverse to reassemble your MacBook Pro. Don’t forget to reattach the battery before screwing the case back on! Test your MacBook Pro once it’s booted by running lots of apps and really stressing the machine until the fans are spinning. If you get any kind of crash or freeze then you might not have applied the heatsink properly, and should repeat the steps above. Below are before and after figures for temperatures, as provided by the excellent Hardware Monitor app. To get these figures I closed all apps and then let my MacBook Pro idle for around five minutes, only moving the mouse cursor occasionally to stop the MacBook Pro entering sleep mode. The difference is quite incredible. Look at the CPU and GRAPH figures, which represent the CPU and GPU respectively. Note that the fans, identified here as LEFT and RIGHT, were spinning at their minimum rotational velocities, so don’t reflect any temperature difference in this instance. When this measurement was taken the MacBook Pro was doing nothing in particular, with a handful of basic apps open. In other words, comparing the factory-applied thermal grease to my own attempts, I might’ve managed to drop the CPU and GPU idle temperatures by 8 degrees. That’s just incredible. Now do you see why this is worth doing for a long and healthy life for your MacBook Pro? Need advise on purchasing a Mac Book Pro. In over 30 years of usually intense personal computing, I’ve never had a CPU or GPU fail; problems were other parts failing on the logic board, on the spinning disks and in the power supplies. So it’d be good to understand this work in the context of how it will really help. If it reduces the risk of failure from 0.5% to 0.4%, it’s probably not worth doing except for the pleasure/geekery of it. Spending maybe $100 of time/supplies with a 99.9% chance of not mattering means an expected cost of 1000 X $100. Add also the risk of screwing up. I presume that this work merely moves the heat away from the 2 chips faster, and won’t affect the many heat-sensitive parts in the rest of the MBP. So it’d be nice to know what Intel or anybody else says about the CPU’s life span at different temps. Thanks again, and in advance for a reply. I’m afraid I can’t provide the reassurances you need because what I wrote is based on my own experience, and that of others. It’s a bit like applying underseal to a car. Will it work without it? Yes. Will it work for many years. Yes, Will it last for many years? Well, that’s why we apply underseal – and it’s only when you’ve had rust that you see the light. The info you’re looking for is out there on Google. Macs undoubtedly have issues surrounding GPU death, related often to Apple’s poor quality manufacturing (there’s a product recall on several models) but as I mention in the piece lots of people ascribe their troubles to poor cooling. Indeed, Apple repairers like Louis Rossmann are a little obsessed with the poor state of cooling on MacBook Pro computers. Nice text! A curiosity (non related to the article): What wallpaper is that? This is great advice, very technical but it would be wise to follow if you want to keep a Mac around for as long as possible. I suspect the current (even if ancient) MacBook Pro lineup will be the last true “Pro” Mac lineup that Apple made, so if you have one, take good care of it! Everything is USB-C, dongles, and no fans from here on out… for better or worse. One step you missed – whilst you’ve got the machine disassembled, one should take a small paint-brush to the fan-blades and the radiator fins to dislodge the dried-on dust crud. Compressed air is never enough, because the build-up is being held on by bits of airborne fats and dead skin-cells. Light brushing is enough. I can recommend this procedure, for a reason not given above. The chips are specified to run at a given speed at a given level of cooling when they are manufactured. If they’re not able to get the correct amount of cooling, they will overheat under load and throttle. I never noticed this in Mac OS, but under Bootcamp, it resulted in games going unplayably choppily. Not a low frame rate, but a high frame rate punctuated by a lower frame rate about twice a second. Average frame rate could be 200fps, but the problem is during the throttled parts, time actually slows down, which just makes games impossible to play. After years of trying to figure out why this was happening, I replaced the thermal paste this evening and everything just works perfectly now. I concur that it’s not really a trivial task, because you have to have an idea what you can and cannot do (you can’t let a crumb of old thermal paste go anywhere on the logic board, for example), but it is totally worthwhile.